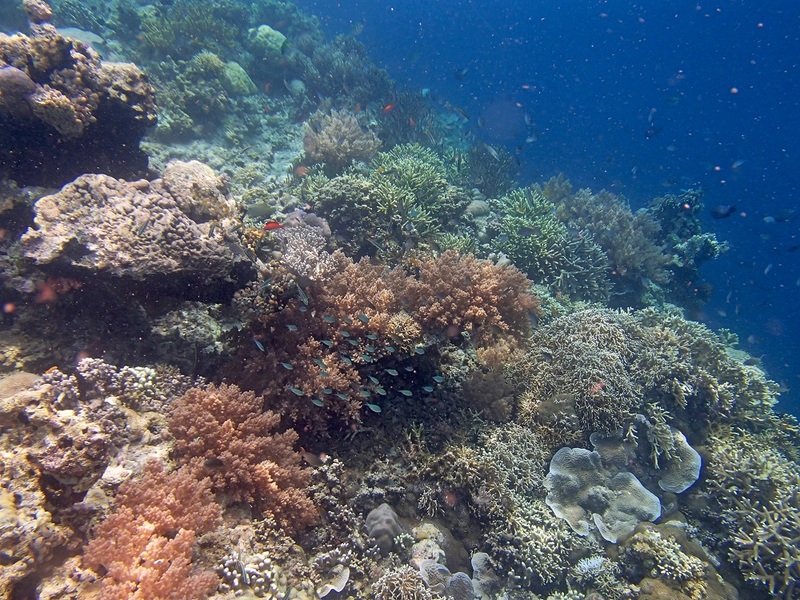 The Menjangan Part 2: Underwater Gardens | What an Amazing World! He plunged into the water and darted in front of us, the effortless movements of his slender body a telltale of his affinity to the ocean. He looked around, scanning the corals beneath him, and noticed a small arch encrusted with corals tucked amid the colorful garden. Suddenly he took a dive a few meters deep, and swam through the small brittle arch, before finally resurfaced. His graceful maneuver reminded me that of a dolphin. The Frenchman, Nicolas, was born in Tahiti, and the ocean has never been far from his life – probably also part of his decision to move to Bali, as well as his career of choice as a marine videographer. Together with Made the snorkeling guide, a Singaporean travel writer who couldn’t swim, an aloof and at times seemingly confused Melburnian, James and I, we set off for Menjangan Island off the coast of Bali’s northwest earlier that day. Our boat harbored at one of the island’s beaches, adjacent to another boat which arrived earlier. Before we jumped off to the water, Made reminded us to always stay in group. With a bell-equipped stainless steel rod in hand, he was clearly the one to follow. I obediently swam behind him and tried to not lose sight of the man, although the beauty underneath occasionally distracted me. 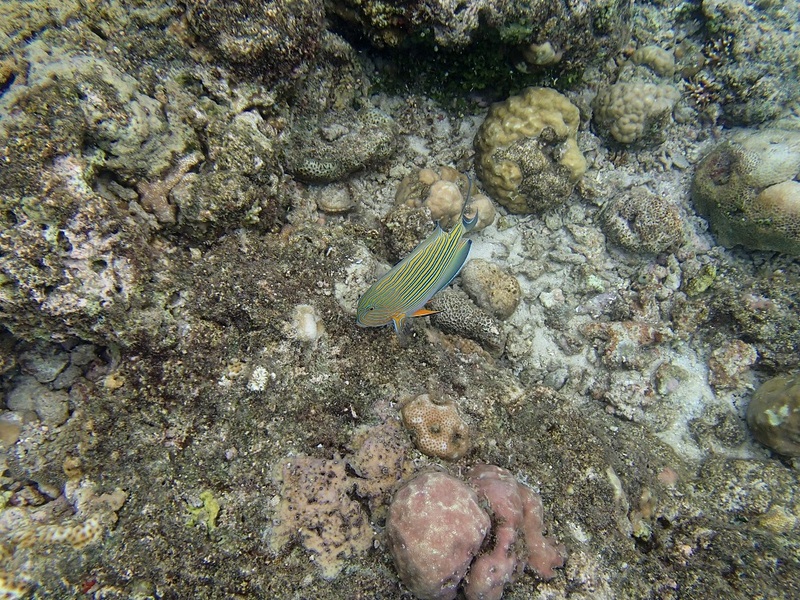 I spotted and further inspected striped surgeonfish, checkerboard wrasse, neon damselfish and more colorful underwater critters before I realized that Made was nowhere close. However the relatively gentle current assured me that there was nothing to worry about, unlike what I experienced around the Pink Beach at the Komodo National Park. Suddenly a loud metal rattle emanated through the water coming from a direction. I swam towards the source of the sound and found Made with his small bell. When he saw me he pointed down, using the stainless steel rod, towards a certain point at the coral reefs. My eyes followed and I swam in circle, struggling to see what he was pointing at. Then there it was. A small moray eel hiding inside a crevice, waiting patiently to ambush its prey. 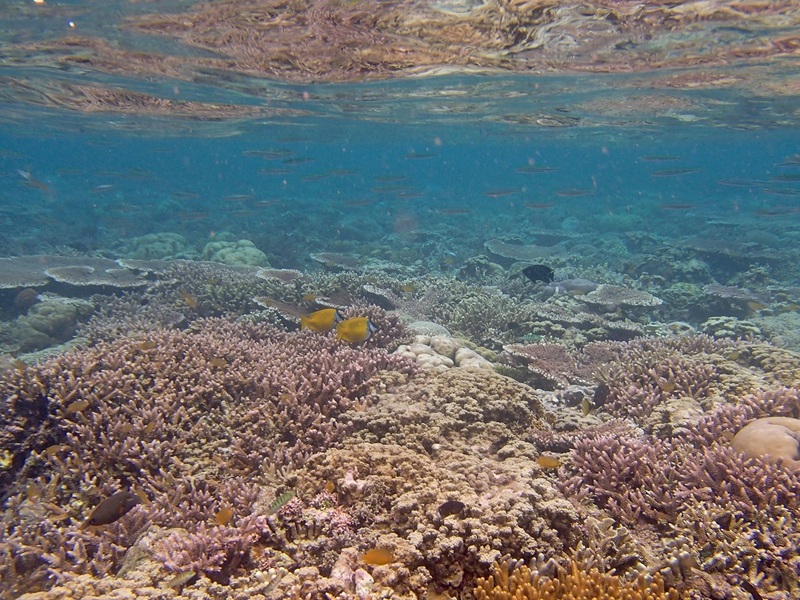 He knew every nook and cranny of the colorful coral carpet blanketing Menjangan’s underwater shorelines, as well as the wall that dropped down into the depths. 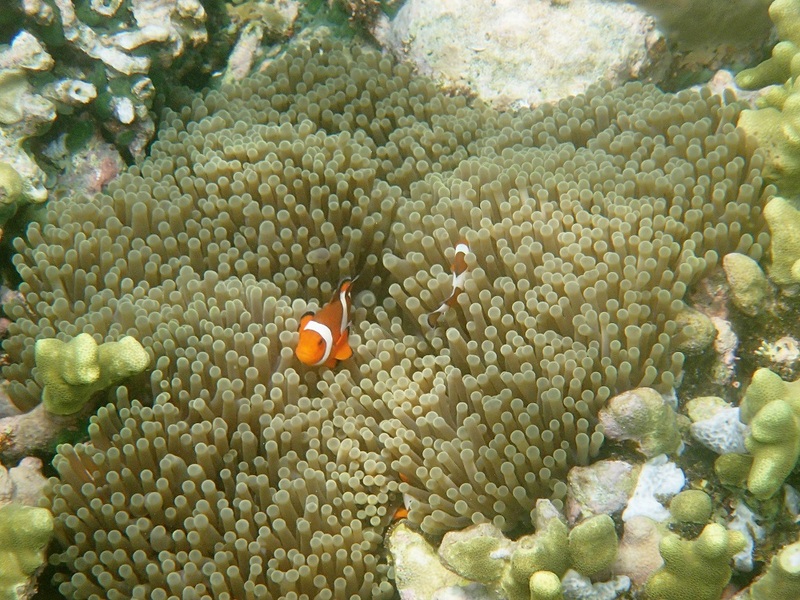 At the second snorkeling site, a few hundreds of meters away from the first, he helped me spot two types of clownfish rubbing their bodies around stinging anemones: Ocellaris clownfish (the species of Nemo) and Clarke’s anemonefish. 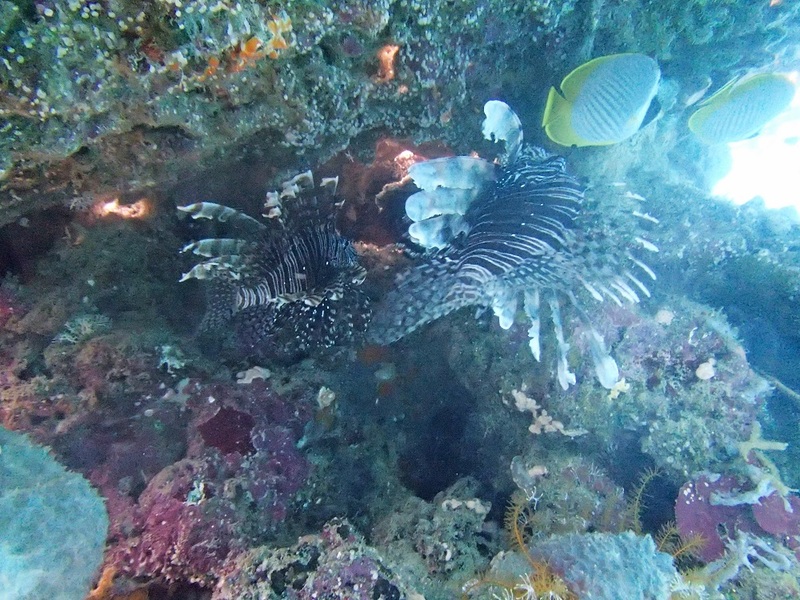 I followed him while marveling at the sheer drop of the wall, bordered by red gorgonian sea fans and giant table corals. At one point Made stopped and looked down at a section of the wall, seemingly attracted by something I couldn’t see. He signaled to me to give him the underwater camera I was holding. He then took a dive. Moments later he resurfaced and handed the camera back to me as it was apparent that he had spotted some lionfish and managed to capture some images of them. This underwater world is his playground after all. One hour earlier, however, I spotted a type of fish I had never seen before, swimming around in such a bizarre way. Excited, I came closer, only to be faced with a hard reality: the ‘fish’ was apparently a plastic bag, carried away to the sea by the currents. A recent eye-opening research suggests that China and Indonesia account for more than a third of all plastic waste washed out to the sea, and the trend goes anywhere but down as the world’s economy continues to grow while people’s awareness of the ecological impact of plastic garbage, particularly in developing countries, is still worryingly low. Except in Rwanda, of course, where a nationwide ban on plastic bags has been in effect since 2008. 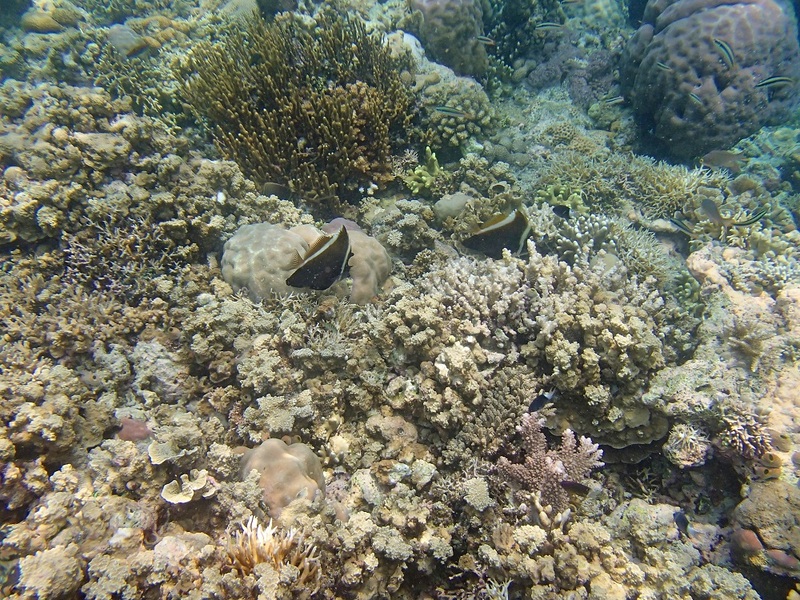 Made explained to us that every year a group of scientists always come to Menjangan to measure the coral growth as an important indicator of how healthy, or not, the waters around the national park have become. As far as I could see things were looking good, despite the fact that Menjangan Island was not exempted from the annual ‘trash season’, bringing garbage swept away by sea currents. 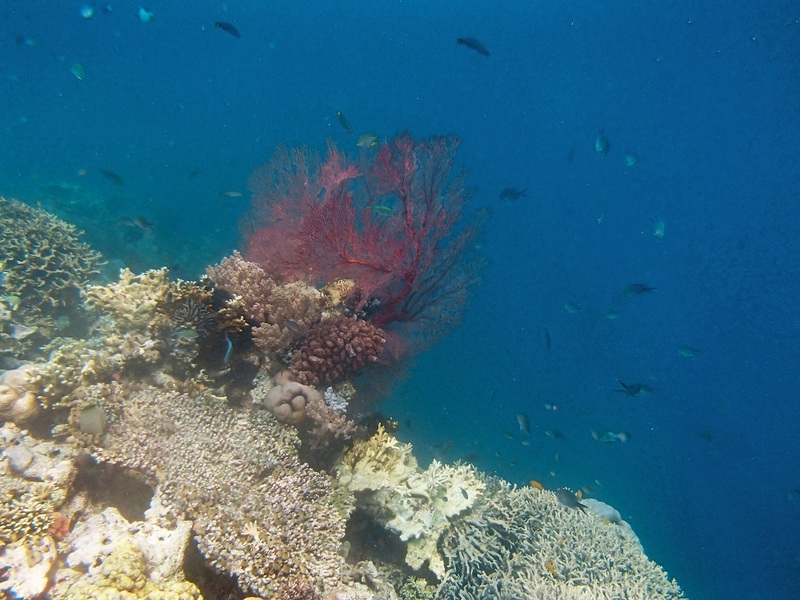 The problem is certainly not to be taken lightly, but in spite of that Menjangan’s underwater gardens are nothing short of amazing, a true world-class snorkeling and diving site in a remote corner of Bali. On our way back to the mainland Made told us, “the Japanese are the best tourists… they always say ‘good’ even though the visibility is low due to the plastic garbage,” he chuckled. Thanks Ana Lucia. The marine life around the island was truly remarkable. Wow, it’s so interesting, I felt like I studied this underwater world with you! It was my second time snorkeling and I too learned so much about the diversity of fish and coral species. Wow!! Interesting shots portraying such a beautiful and mysterious world. Below the sea surface is indeed a world we know so little about, and snorkeling is a way to pique our interest towards the underwater wonders. Thank you! Wow! Stunning underwater images Bama! What an amazing variety of fish, I hadn’t heard of many of them before. I hope the authorities can ensure the survival of this fragile eco system. Thank you, Madhu. 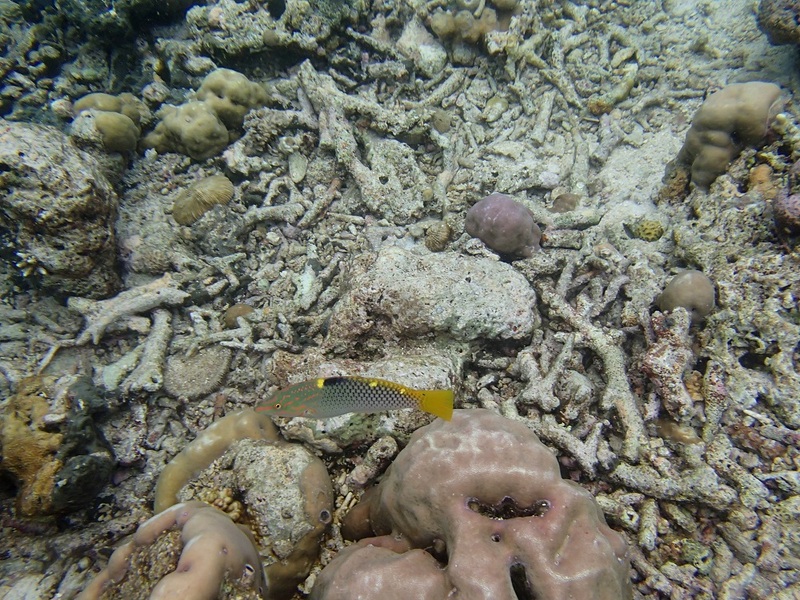 Before the trip my knowledge of fish species in coral reef was limited to Nemo and ‘other colorful fish’. Luckily the resort has a catalog which James and I referred to after snorkeling at both sites. Coral reef is so important to sustain life on earth, yet it is one of the most fragile ecosystems on the planet. Efforts have been made, but public awareness is a big homework in developing countries like Indonesia. Bama, it’s very interesting to see how we took different pictures with the same camera. 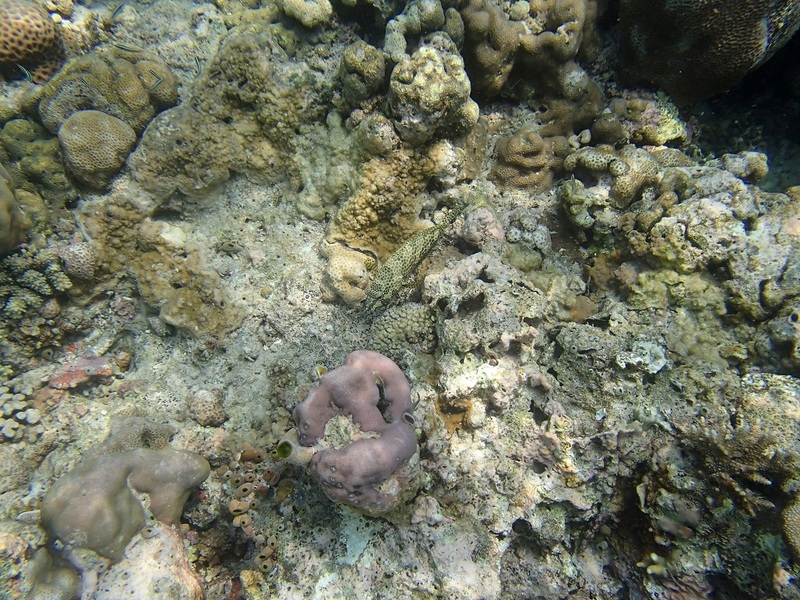 I was more keen on taking wide shots of the reef, while you had a knack for capturing fish species up close. 🙂 One of my favourite photos is the one of the blackbelly triggerfish. I wish I too saw the moray eel, although they can be quite vicious if you’re not careful! Wow! I loved the pictures. Such amazing species! The biodiversity of this world amazes me everyday. 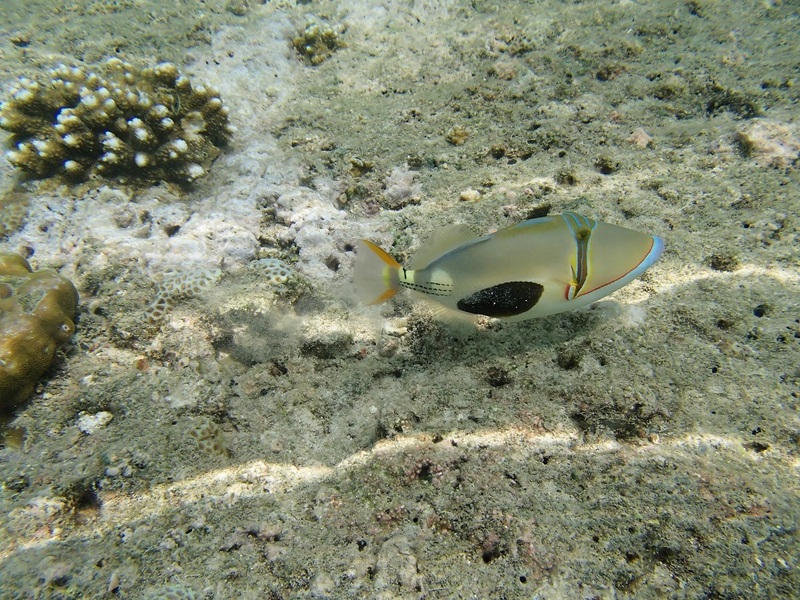 The Blackbelly triggerfish is a quite unique one. Thank you, Zaida. We all surely hope that this underwater wonder will always remain pristine, not only because of its beauty but also its crucial role for life on the planet. Yes, absolutely. These wonders of nature should be preserved forever. The way you hunt for ‘plastic bag’ creature made me laugh. But this plastic waste thing is such a shame for our country, right? Looks like we must learn a lot from Rwanda..
Yea, I was so excited to see a sea creature I’ve never seen before, until I realized it wasn’t a living organism. 🙂 Indonesia is so beautiful, but many of us take it for granted. Thank you, Belle. 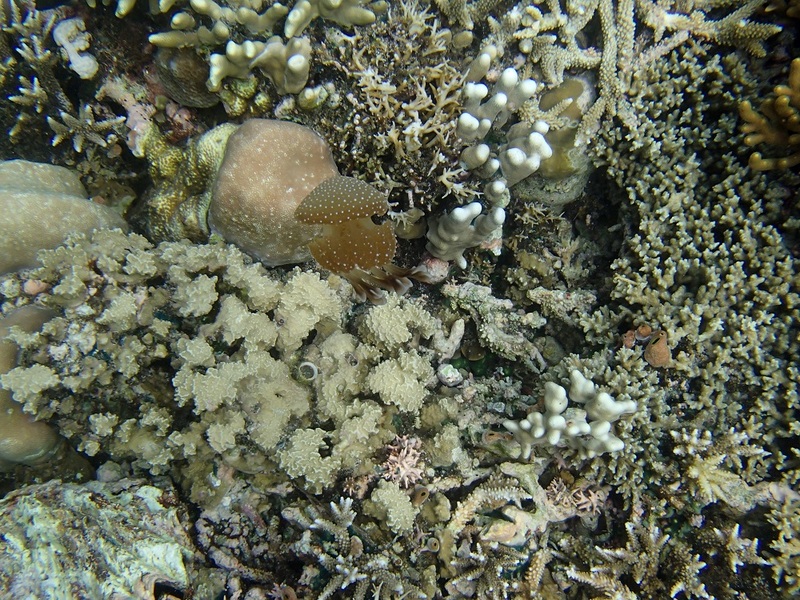 Its relatively remote location helps the corals thrive. You’ve brought back memories from when I snorkelled over a tiny section of the Great Barrier Reef. I never wanted my fun in the water to end. Being in the water to see those marvelous coral reefs and colorful fish was something I never wanted to end either. All these years I could only marvel at the underwater beauty through the TV, so seeing them by myself was such an unforgettable moment. 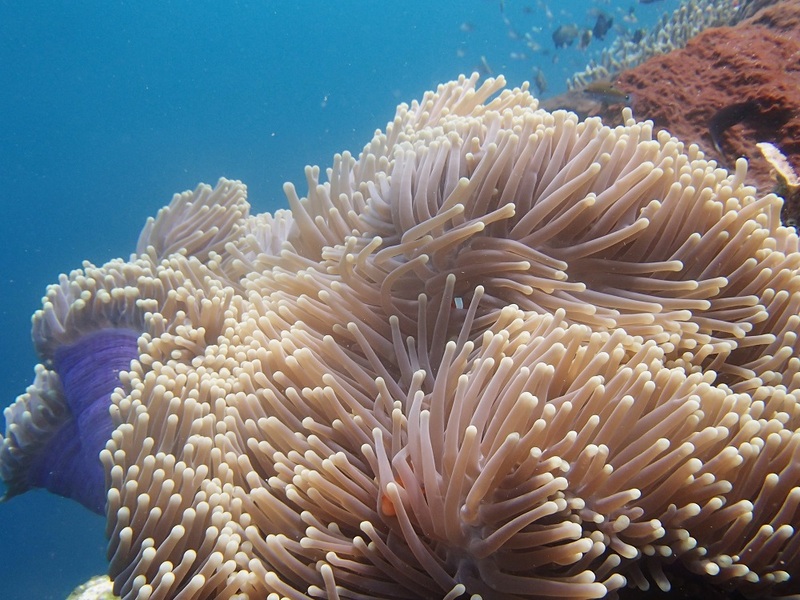 Snorkeling at the Great Barrier Reef must have been an unforgettable experience for you. It was unforgettable but just a little scary because no one else on the boat cruise wanted to snorkel so I kept looking up to make sure the boat didn’t leave me behind. Oh dear, I thought everyone who went to the Great Barrier Reef always wanted to snorkel there. Were they afraid of sharks? Ahh, I see. There’s also such tour in southeastern Bali. Wonderful! I’ve never been to coral like that – this makes me want to visit even more. Sad about the plastic bags, though I am glad you mentioned it to bring attention to it. Having been to Rwanda, the impact of their plastic bag ban is huge! There is a noticeable difference in roadside litter as soon as you cross the border. Sadly many people are not aware of the consequences of throwing away plastic garbage to the river, they won’t magically disappear. This blog is also a means for me to raise people’s awareness of their impact to the environment — that’s the least I can do. Rwanda has set the bar very high and hopefully more countries will take the same step. Wow, the underwater world there is truly amazing. 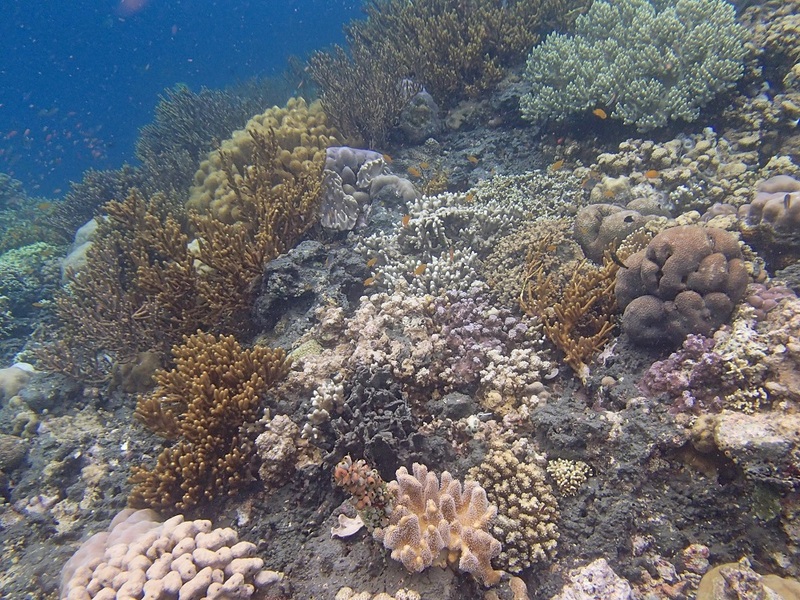 From the first picture, it’s so shallow and yet the corals are already remarkable. Very beautiful :)). I like it when coral reefs are that shallow, because I’m not the best swimmer of all. 🙂 People have been raving about Komodo, Raja Ampat and Wakatobi, but Menjangan’s marine life is nothing short of breathtaking. Ah, I, too aren’t the best swimmer, so shallower is better for me :hihi. Wonderful pictures. I always love diving because it reminds me of how vast and beautiful a world exists under the sea. These are such colourful and incredible creatures in a self contained eco-system. I’m longing again for another dive or snorkel. Thank you for reading. Snorkeling has already amazed me — I can imagine how much wonder down there to be discovered by diving. I have yet to get a diving certificate though, which I know I must one day since I live in Indonesia. Hope you’ll be on another dive or snorkel trip soon! Thank you, Sue. You would love snorkeling there! Although I know you’re also prone to motion sickness like me, as long as you don’t eat too much for breakfast then you should be okay. I remember I almost went to Menjangan while I was at Baluran, but canceled. Hope I could go there soon! 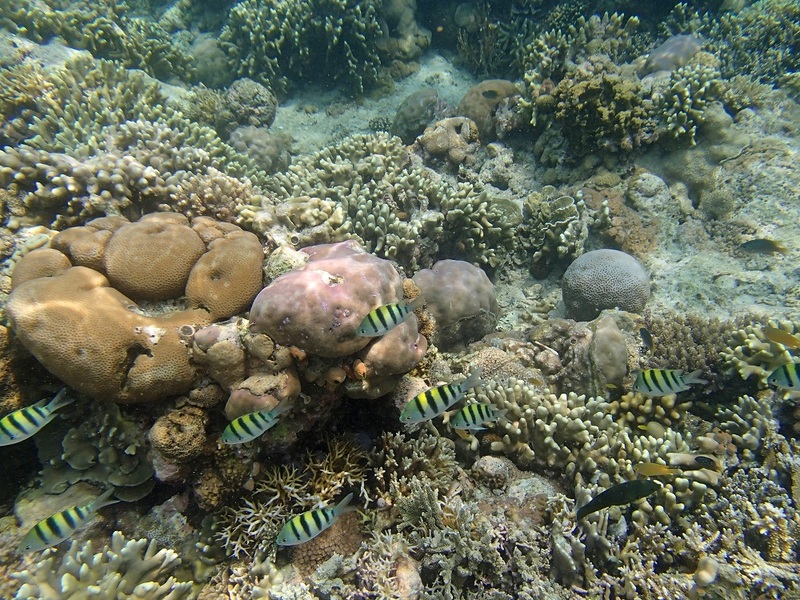 For better snorkeling experience make sure to time your visit during dry season. Our guide told us that the snorkeling site at the other side of the island was even better, shame the weather was not permitting when we went. Great photos and important words too. Thank you. Hopefully this little piece helps raise people’s awareness of the importance to keep our oceans clean. Those are some amazing photos! Thanks for sharing. And thank you for reading and leaving such a kind comment, Cristoph. Wonderful account of this obviously very beautiful place, and I like that the garbage doesn’t seem to affect it too much. Thank you for taking me a little bit into this lovely underwater world. Thank you, Alison. Apart from the false new-fish-species-sighting, the garbage was quite in ‘normal’ level, although things could have been better for the environment. Thank you for reading, Alison, and for posting stories about nature and cultures around the globe. They remind us why a healthy planet is crucial for healthy human beings. Hi Bama, I love this underwater gardens, The corals are so colorful and so are the fish. I like the one with little blue fish and with nemo; they’re so adorable. Your photos look so alive; seemed like that fish are about to move anytime. I’d like to give that reckless snorkeler some spanking:( I know the plastic issue seems to be getting sadder and sadder. I hope the time will come where all countries curtail the use of plastic bags. 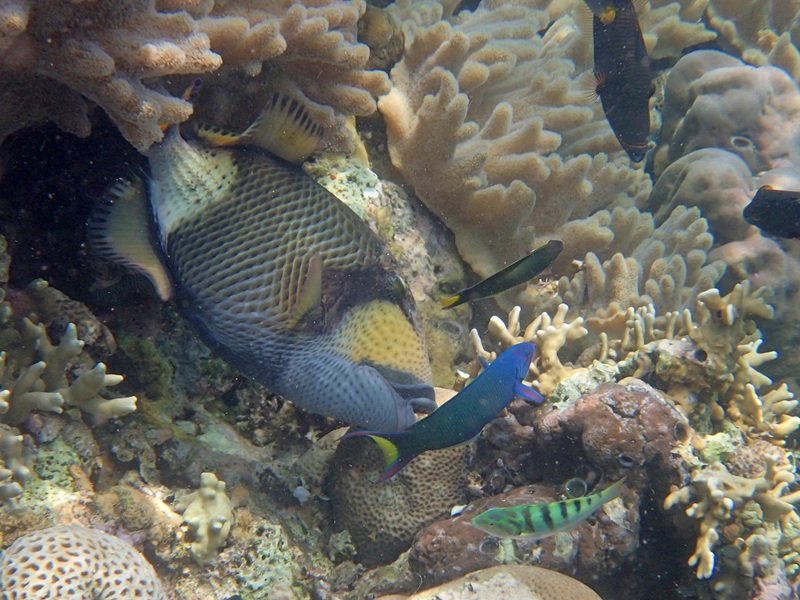 Those neon damselfish also captivated me, I remember saying to myself that seeing those colorful fish in their real habitat is much nicer than seeing them in aquarium. I, too, was shocked to see him standing on corals like that. I think it’s about time all diving/snorkeling operators/guide remind visitors how fragile the underwater ecosystem is, and ask them not to touch, let alone stand on, the corals. As for plastic bags, Indonesia and the Philippines rank 2nd and 3rd respectively in the list of countries which dump plastic waste to the oceans, which is very ironic considering how both countries have some of the best snorkeling/diving sites in the world. 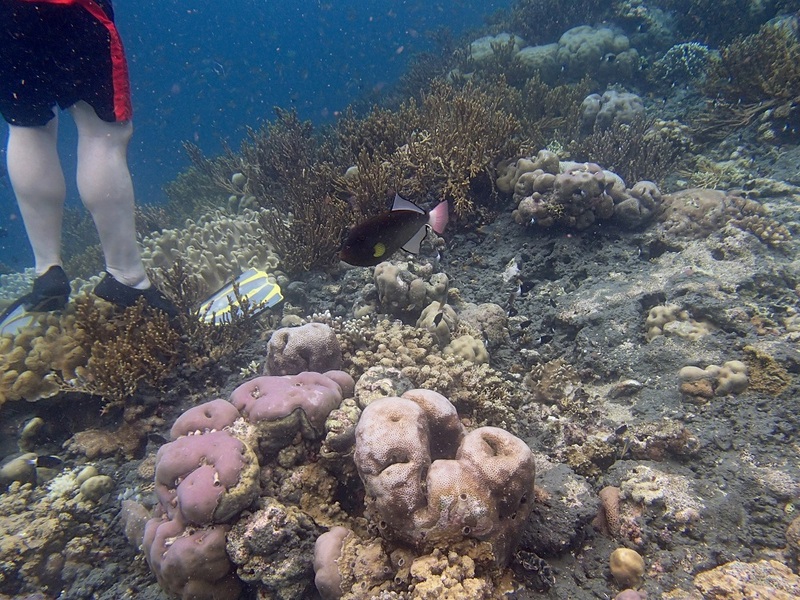 Indah, my heart was broken too when I saw him standing on the corals. I wonder why would anyone go snorkeling only to damage those beautiful coral reefs? It’s everyone’s homework to educate people about marine life and how to save them from destruction, and you’ve done your part, Indah, to educate your readers through your blog posts. Thanks for that! Wien, kalo ke Menjangan lebih baik bukan pas di musim hujan, supaya pengalaman snorkelingnya lebih optimal. Thank you and hopefully you’ll visit the island sooner than later! Thanks for the suggestion too, Bama. So pretty! Always a joy to read your posts. Thank you for your lovely comment, Robin. Glad you enjoyed my posts. I’m sure those who dumped plastic garbage to the rivers didn’t think of the ecological impact of their action. So hopefully by showing a greater audience how beautiful our seas are, more and more people will think twice before they recklessly throw any garbage. We snorkeled in Pantai Bira, Menjangan, 17 Islands NP and several places in Komodo and I’d say that Menjangan was the best. So much color and life. We missed the trash season there but saw it in 17 islands. it is really sad to see. Thanks for sharing. Wow! I know Menjangan was very beautiful but I didn’t realize that it’s THAT pretty, since you compare it with places like Bira and 17 Islands. Did you also snorkel at the northern coasts of the island? We didn’t because our guide told us the current was too strong in January, the time we went. At Menjanga, we were on the north side, if that is what you mean. Everywhere we went was really impressive, but Menjangan was the best. Komodo was tough due to the currents. Komodo was the first time I snorkeled, ever, and you know how strong the currents are. So at times I thought ‘why am I doing this?’. But once I managed to breathe normally through the snorkel and to not swim frantically, it was such a rewarding experience indeed. Awesome story! We love going snorkeling as often as we can but always feel a bit awkward when we see the locals gracefully moving in the water. We can swim, but they make us look silly haha. Your photos turned out wonderfully underwater, by the way. We use our GoPro for video and pictures, but the color turns too green unless we have our red filter on. What do you use? Beautiful photos! Isn’t it amazing that Rwanda is leading the world in the war on plastic bags? I didn’t know so much trash was coming specifically from China and Indonesia. And that reckless snorkeler! Unbelievable! You’ve captured the beauty and the conflict of the ocean in one great post. Kelly! Sorry, somehow I missed this comment of yours. I’ve been looking up places in Asia with white sandy beaches and great snorkeling sites, then I decided to reread this old post. Thanks for your kind comment, as always! Now that I think of it, if I wish I said something to that guy so he wouldn’t do the same mistake again. Wow, I’ve been thinking of properly visiting Manado — I stayed overnight near the airport because we couldn’t land in Ternate due to strong winds. Great! I’ll look up your post now. Thanks for the recommendation, Kelly. Ouch! It’s almost painful to see that guy’s fins on the coral. You’d think a dive master would say something like: “don’t stand on the animals” or something? I love plastic bags, don’t know how I’d get through a day without one, but…sometimes the price is too high for comfort and ease? We could go back to paper bags, or learn how to use a garbage can. All diving instructor or snorkeling guide should remind everyone to stay clear from the coral reefs, because apparently some people are just so ignorant. Plastic bags are really hard to avoid these days, but I’ll try to always make sure that if I really need to use a plastic bag, it should be a biodegradable one. They make biodegradable plastic bags? That’s cool. Sign me up. About the photo and story in general though – beautiful 🙂 I love your photography, and your writing makes me imagine I am there!! It’s really sad to read about the threat the Great Barrier Reef is facing, let alone the unnecessary pressure from tourism activities. However through our blogs hopefully we help raise people’s awareness of this issue. Unless we generate the energy needed to maintain our comfort from renewable resources. Which I think is unlikely to happen, but maybe I’m just a wet blanket 😉 what do u think are the prospects? The damage that humans do inflict on coral reefs and our waterways is incredible…I cannot comprehend how we still do not get it ~ but I do think slowly and surely it will improve. Some people are worryingly still unaware of the impact of their lifestyle to the environment, but some just don’t really care, which is a shame especially if we see how beautiful our planet is and how threatened it is now. However I do believe that we can still reverse the trend and make this planet a better place to live in. Great underwater photos! 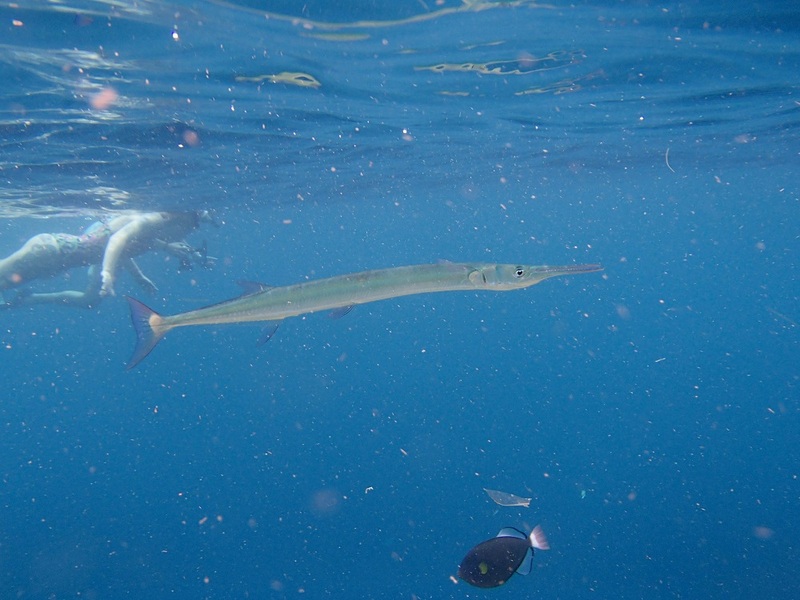 I was just on Maui where I went snorkelling for the first time at Molokini crater:) Yes, I know, a bit late snorkelling for the first time after you’ve passed 30 – but being from the far north where the ocean is freezing year round snorkelling is just not something people do! 🙂 But it was an amazing experience, I would love to do it again! What kind of camera do you use for your pictures? We only had our go pro with us, and the pictures were ok at best:) But we did see an eel as well! Thank you, Inger. There’s no such thing as too late to live life to the fullest and try those adventures. 🙂 Despite having been living in Indonesia since I was born, my first ever snorkeling experience only happened last year, and now I have a serious case of addiction. 🙂 I used a rented camera, an Olympus TG-820. Reblogged this on Curiosidades del mundo. 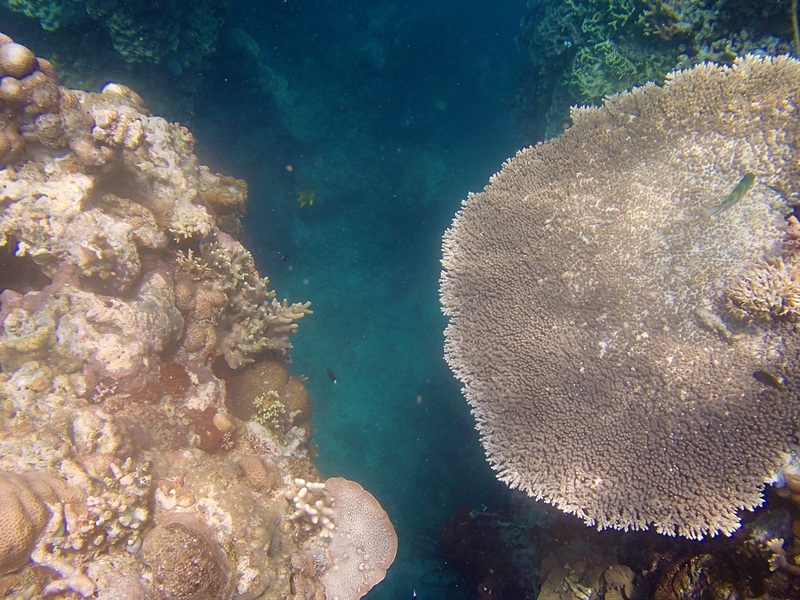 I have to say, I was surprised on how good the corals were in Menjangan. And thanks for bringing up the trash issue. It really needs to address as much as possible. So was I. 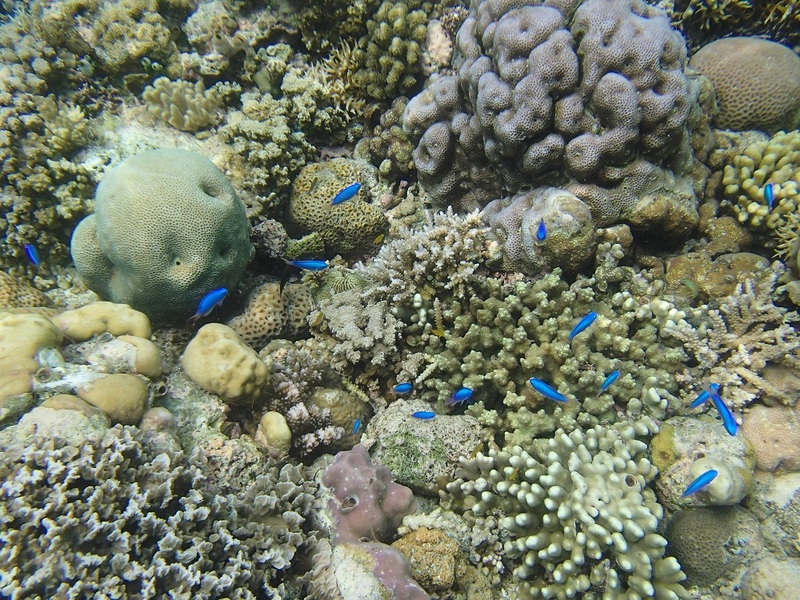 But I heard even in places not too far from Jakarta the corals can be quite amazing as well. About the trash issue it really is a massive problem. First there are the ‘uneducated’ locals who throw trash into the sea anyway despite the fact that such practice only endanger their livelihood in the long run. Then the regulation (or the lack of enforcement in many cases), also there’s no incentive or any scheme rewarding people who use less plastic. I guess bringing more awareness is a good start.